On 17th September 2014 we were awarded a Gold award together with the Busfield Arms. Below are some of the notes from the judges. There is a high quality of planting. The village is very clean and tidy. The judges were impressed by the number and friendliness of all the people we met. The 50th Anniversary of Britain in Bloom sign and display. Good mix of plant material using both permanent and annual. The reuse of bulbs and spring planting. Runner beans using a tree for support and the community planters cared for by villagers. Maximising opportunities to develop the available land e.g. the orchard, wildflower meadows, play area and planter behind the institute. Spotlessly clean, especially as it was the day after the Gala The number of people at the coffee morning and the diversity of the groups represented was very impressive. The display board at the institute showing the group’s activities. 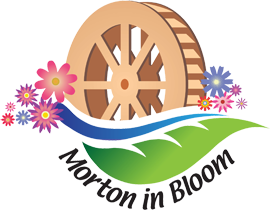 Morton Meet’s involvement in the raised bed and the support of Morton in Bloom. The “Judging Today” banner and the school posters around the village. Evidence of the involvement of the school was outstanding, especially the enthusiasm and knowledge of the children. We also have a discretionary Yorkshire Rose award for our celebration of RHS 50 years of Britain in Bloom! We are always keen to hear from any volunteers who could offer a few hours here and there – please get in touch if you can help. Please email: David Flaherty for further info.